Cool! 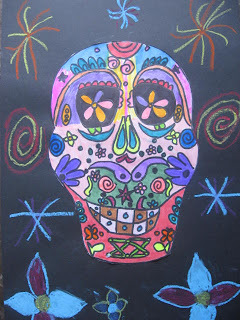 I am in the middle of a Day of the Dead project with 4th grade students. 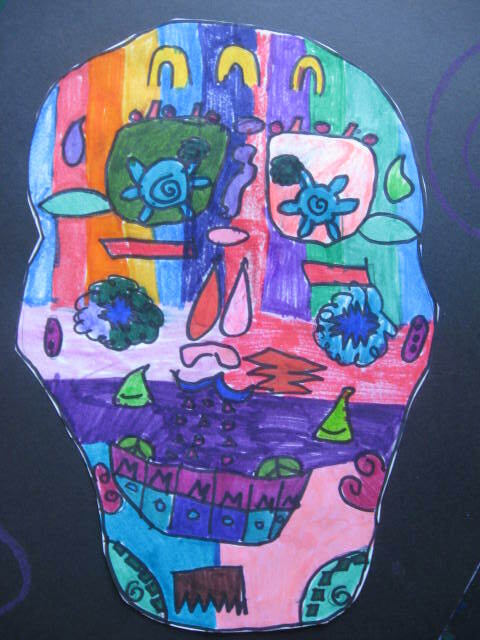 They already made clay skulls and will paint them in their next class. Unfortunately, I have a couple of students who are not allowed to make the project because it's a "holiday". 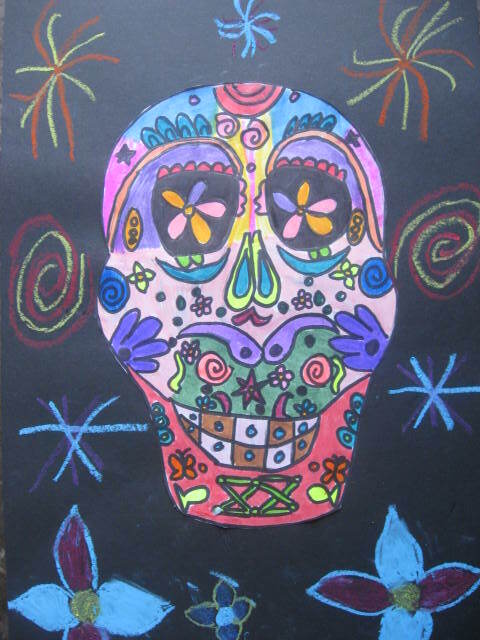 I tried to explain to the parents that I presented it as learning about another culture and folk art, nothing to do with Halloween but that didn't fly. I'm sad that not all my students get to start/complete the project but the rest are LOVING IT! I really like your project! I may show my students the pictures to help give them ideas on how to paint their skulls. Thanks Katie. I did worry a bit that this project might be controversial for some ( I'm doing it with younger students as well.) We have such a large Mexican population here in Southern California that I felt it was relevant on a cultural level. Can't wait to see your clay skulls! I have the same problem! Some kids (let's just say the same two every year) that even after learning about the culture and seeing the video and folk art don't want to participate. They suggested making pumpkins and ghosts instead ummm okay what does that have to do with anything (seems a little contradictory) but I let them do a symmetry project using marigolds as imagery. . . I never contacted their parents too much else on the plate! Maybe when I see them around the school. Mary they are awesome! Love the details that they were able to mirror. Did you see that drawing with both hands exercise? 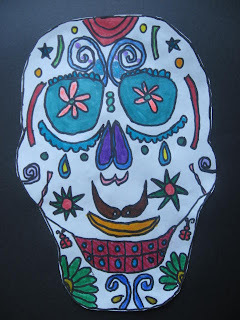 I've been doing symmetrical sugar skull designs too and was thinking of using this exercise to warm up. Basically the kids draw with both hands (like a mirror) the same thing, scribbles shapes whatever, they don't even have to look at their paper. Erica, I haven't seen the drawing with both hands exercise. I'll have to check it out. I haven't had anyone object to the project for religious or belief reasons. But this project tanked when it came to most of the boys. When I had to explain again, that they couldn't make it a gory skull with blood, they lost interest and did the project half-heartedly. These are AWESOME! 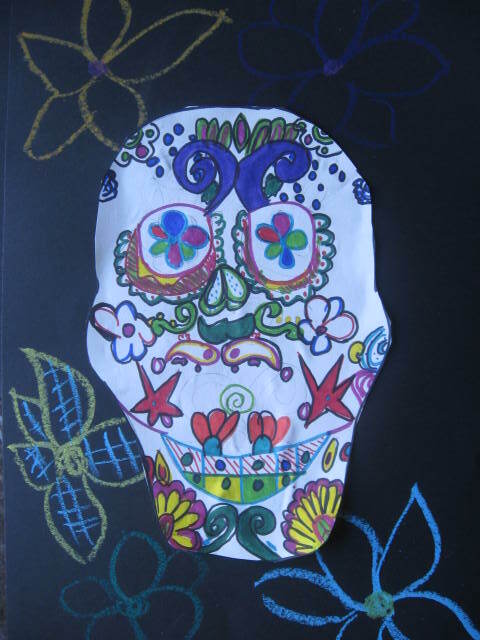 My students are working on some calaveras as well. We are in Texas, and of course it is a cultural tradition for many of the students at my school. They have been so excited to work on this! Thanks for sharing these!